I purchased this set for my Granddaughter and she loved it. The sheets are not real thick but they worked just fine. Surprise your daughter by giving her bedding a complete update with this fun bed-in-a-bag set. Featuring a colorful pastel leopard print, this bedding is playful and girly without being overly childish. This set includes a comforter, shams, sheets, and pillowcases. The sheets in this set are very comfortable- the comforter however is not nearly as bright and vivid as it looks online. I read in the reviews before I bought it and other people said the same thing but I thought it would have just been a little lighter- once I received it I realized to what extent they meant- it is more of a pastel color and no where near neon. The set itself is pretty nice though just wish it was brighter. Shipping was ridiculously fast though! I bought this for a tween's room. The comforter isn't very heavy but softer than most polyester sets. 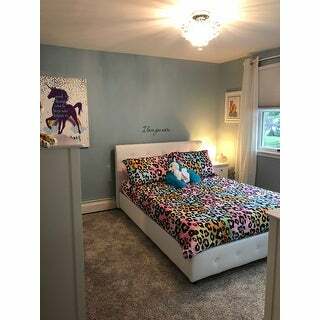 It's definitely worth the money-if it lasts for the winter I will be pleased...she loves it...not quite my style but we're going for a funky animal print/rainbow dream room. This is a very cute comforter if your looking for a "softer" version of a wild child. I bought this for my 10 year old niece, we were very disappointed when we opened the box. The comforter looks NOTHING like the picture you see. It is NOT neon at all, it's pastel at best. In my opinion it looks washed out and faded. The sad thing is, the label on the packaging is the same picture you see, but with the actual product behind it, you can see a very defined difference. Set includes everything to complete a full bed. Comforter is nicely made and sheets are soft. Very please with the quality of the set. Perfect for a young girl! got this as a housewarming gift for my niece when she moved into her first apartment and she loved it! the sheets laundered well. Excellent price-thank you overstock. My niece loved the beddings colorful leopard print. It fit well and was soft. My daughter loves animal print, we just upgraded her to a full size from a twin. Fits great, nice quality and very cute! So comfortable... My daughter loves the bright colors and soft sheets. I got this as a gift for my 11 year old daughter. I was very pleased with the colors and fabric. She was very happy with the product as well. Bedding is even nicer in person than pictured. Very comfy and warm! Soft and beautiful. Everything my granddaughter wanted. Colors are the best! I would reccomend this seller, item received in a reasonable amount of time.very happy with the product sent, nice items. I was disappointed once this bedspread came. The colors online in the picture were alot vibrant than in person. Made matching some colors in the room challenging (ie-pillows, curtains, etc) Wish I could of sent it back, but my daughter still liked it. Also wasn't as soft as I thought it would be being microfiber. Maybe I wasn't aware of different microfiber fabrics. It's not soft like my microfiber sofa. Got this for my grand daughter. She loved it. Loved this bed set! Stayed nice after washing! I bought this Bed in a Bag set for a pre-teen girl. She absolutely loved it! She loved pink and her room was done in animal prints. This was perfect. She loved how soft the sheets and the comfortable were when she first got them. They are truly just as soft. The wash very well. My godchildren love their comforter set. This is beautiful! My daughter loves it! Excellent for my granddaughter's room, a great find. "Is the comforter too thick or to thin"
According to customer reviews this is more of a lightweight comforter. "What age would be best for this comforter." This comforter can be used for all ages. However, the print appears to geared towards the pre teen ages in my opinion. "Do it come with a bedD"
Hello dyimond, this item features a comforter, two shams, (one sham with twin), flat sheet, fitted sheet and two pillowcases (one pillowcase with twin). Thank you for shopping with us. "Is there a duvet that matches this bedding?" Hello Brian, unfortunately no. There is not a specific one that matches this bedding. Please let us know if you have any further questions. "Is there any curtains or valances that go well with this set?" Hello michellellk, unfortunately we do not carry any matching pieces for this set. Please let us know if you have additional questions. Thanks for shopping with us. "what are the sheets made out of? Please provide the treat count and fabric blend. Thanks"
The sheets are made from 100 percent polyester microfiber.